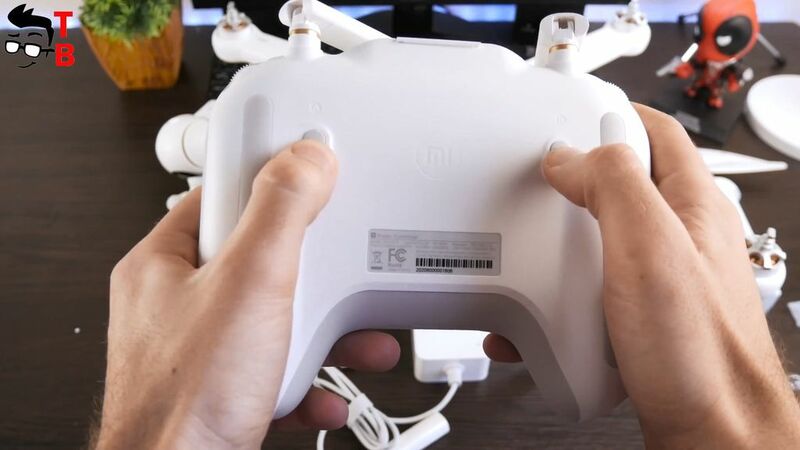 Finally we can make full review of Xiaomi Mi Drone 4K. To be honest, we received this gadget about two months ago, and we had no time to publish unboxing, review and test of Mi Drone 4K. And here it is! We used the drone for all this time, and we have some important words to say. First, I want to tell you some features of new drone. 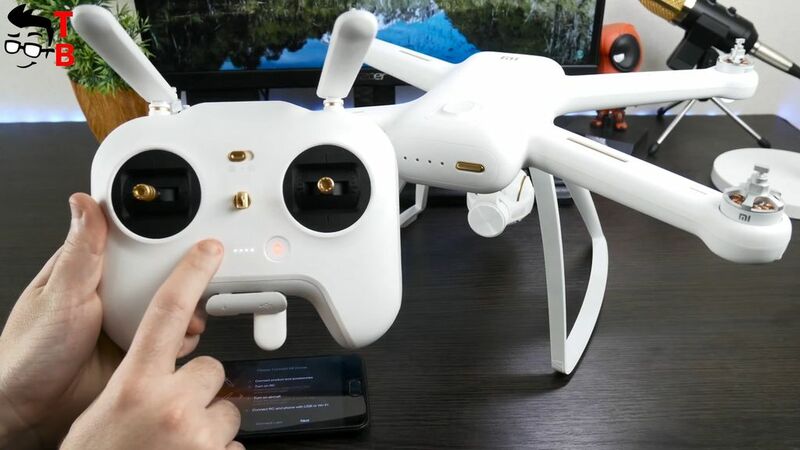 Xiaomi Mi Drone 4K is one of the best and cheapest drones on the market. 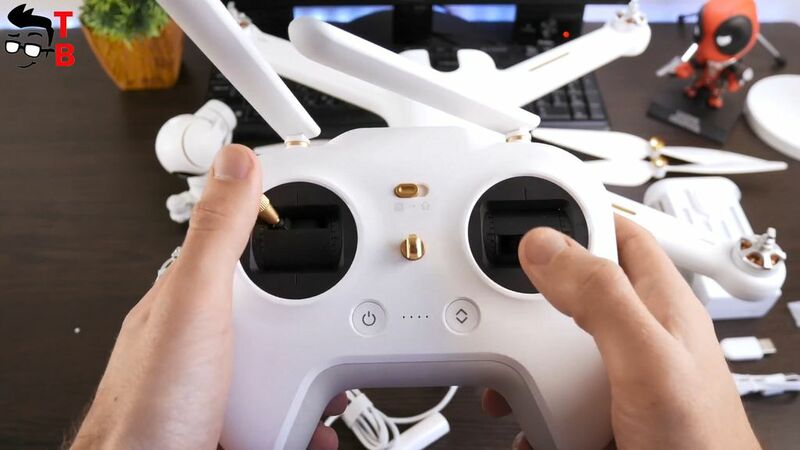 It comes with FPV function that allows you to control it in a distance up to 3 km. Also new drone supports 5 GHz band for better signal. 3 axis gimbal provides better stabilization while recording videos. A little later I’ll talk about all the features, but now let’s make unboxing. 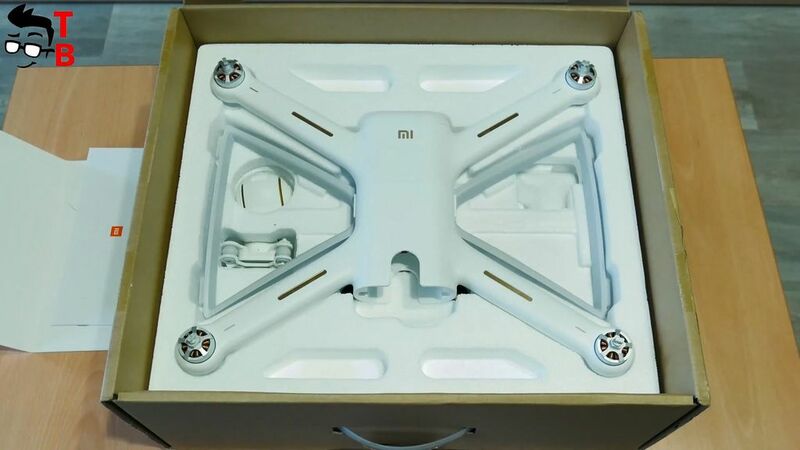 Xiaomi Mi Drone 4K comes in different boxes, depending on country. 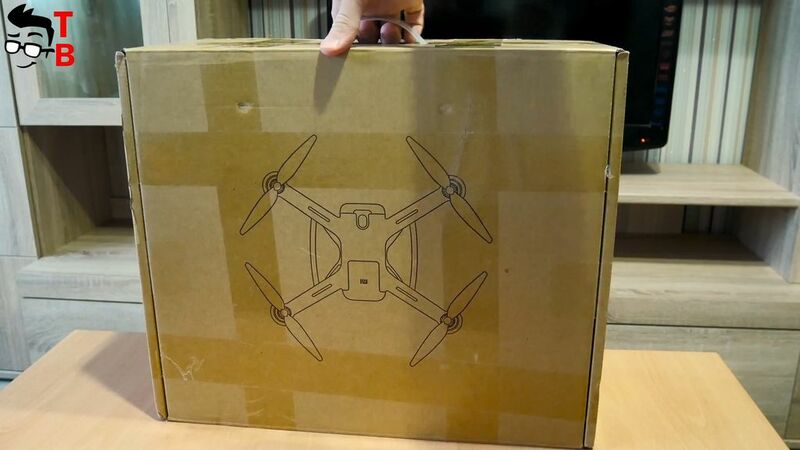 So, I received a cardboard box with image of a drone on the front panel. At the top the box has a handle to carry. This is very important, because the drone does not have a special bag, and the best way to carry it is to use this box. 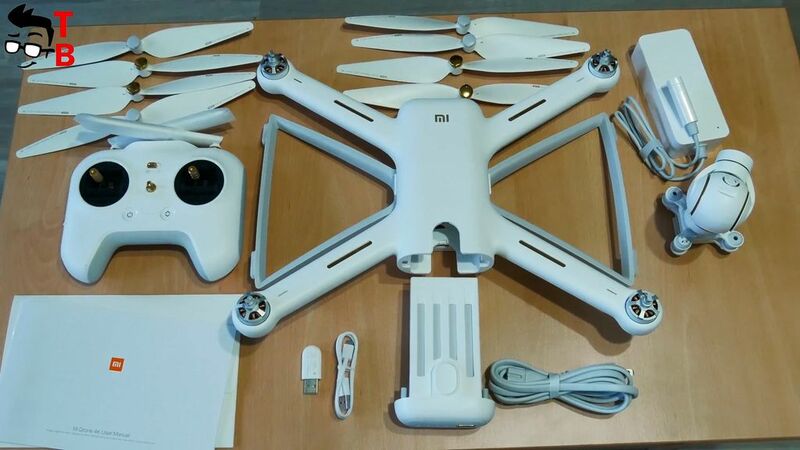 By the way, the Chinese version of the drone has nice white box. I do not know why the package of international version is different from Chinese version, but you should pay attention to it. When you open the box, you can see the drone. To be honest, it is smaller than I thought. But we’ll talk about design a little later. We take the drone aside, and see other interesting things. Everything is neatly packed in transparent packages. 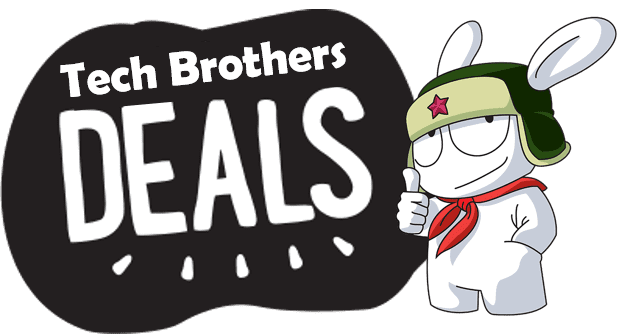 Here are the following devices: transmitter, camera, 5100mAh battery, four spare propellers, (in total there are eight props), USB dongle, and USB cable. That’s all! All you need for flight. I must say that the drone has high built quality and durable package. You do not have to worry about its safety during transportation. You should note that the box is really important, because it will be used every time you decide to go somewhere and run the drone. It seems that design will take up the bigger part of this video, because we need to review each thing separately. Of course, let’s start with the drone itself. 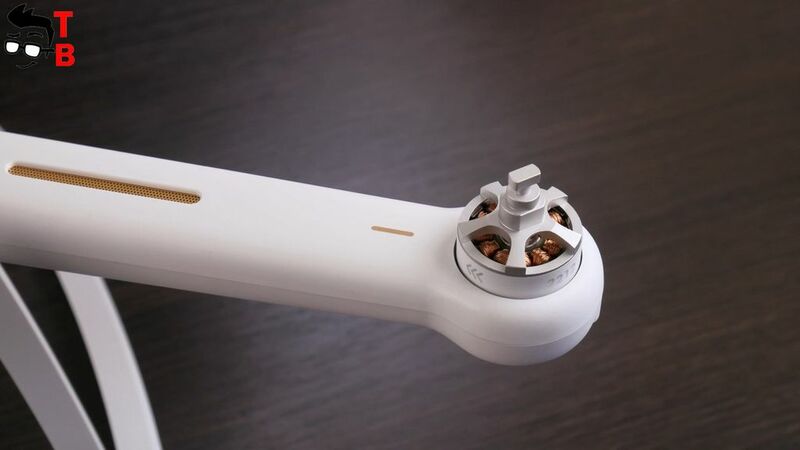 Like most modern drones, Xiaomi Mi Drone 4K has four arms with propellers. The upper side has MI logo. Also there is GPS / GLONASS sensors. The bottom side has two folding legs, and a compartment for attaching the camera. The gimbal port has easy clip solution. Here you can see microUSB port. I think that it is used for firmware updates. You need to connect USB cable and wait for few seconds, and new firmware is installed. Also the bottom side has two ultrasonic sensors and little camera that is used to stabilize the drone indoors, when GPS is not available. 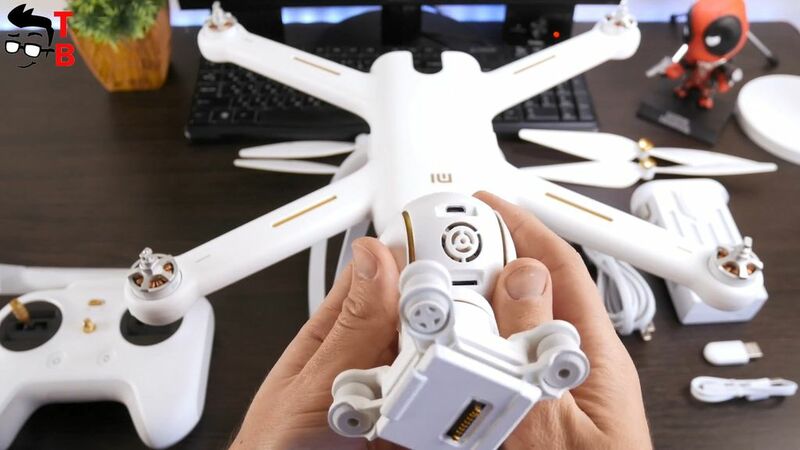 A battery with a capacity of 5100 mAh is inserted into the back side of the drone. It has 4 indicators that notify the battery level. 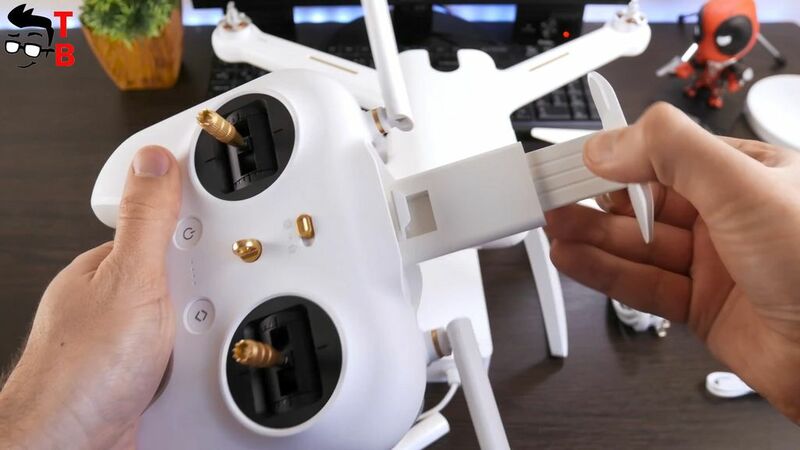 To remove the battery from the drone, you need to press the button on the bottom side, and pull hard. This is difficult enough to do the first time. Propellers have a simple installation. Note that two of them are gold color (they indicate CW motors), while the other two are silver CCW ones. You need to insert the propeller and turn it 90 degrees. As for the gimbal camera, at first glance it does not differ from the previous generation. Nevertheless, now it is able to shoot 4K video. This is a 12-megapixel SONY sensor. Also, the camera is capable of shooting Full HD video at 100fps. It’s amazing! On the back of the camera you can see microUSB port and slot for microSD memory card. And the last thing in the package is Transmitter. It’s really big and good remote control. There is a power and auto flight button. At the top you can see the return home switch. Everything is intuitive. 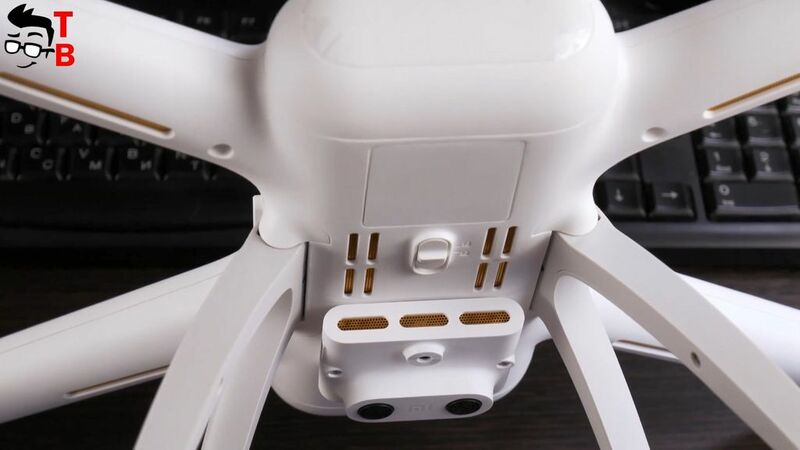 If you press the power button once, you can see the battery level of Transmitter, while one short and one long press turns the drone on. On the reverse side there are two more buttons – right button starts video recording, and left button takes a photo. The bottom hides a microUSB port that is used for charging, and USB port for connecting to smartphone. You can use USB cable or USB dongle to connect to smartphone via Wi-Fi. That’s all! The drone and all other things have high built quality and nice design. 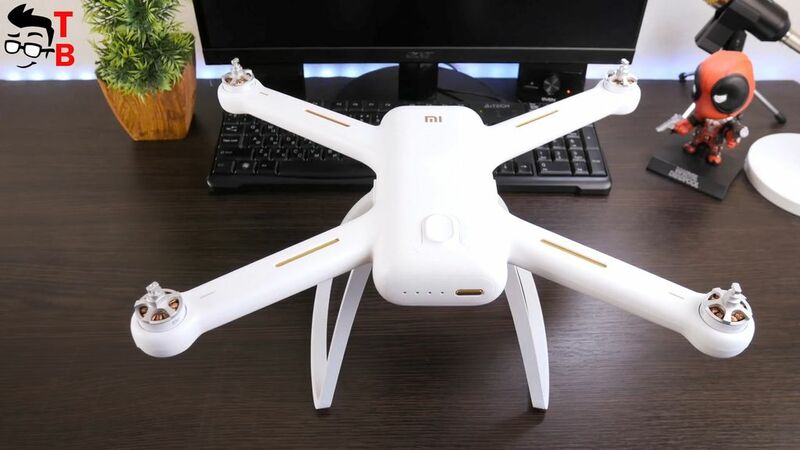 Xiaomi Mi Drone 4K looks like very expensive and premium drone, but its price is quite low. Now I want to talk about basic specifications. I will not go into deep details, but I will tell you what I found useful for me. First, I want to say that control distance is 2000m, although some users reached 3 or even 4 km. Also you should know the flight time is about 27 minutes. 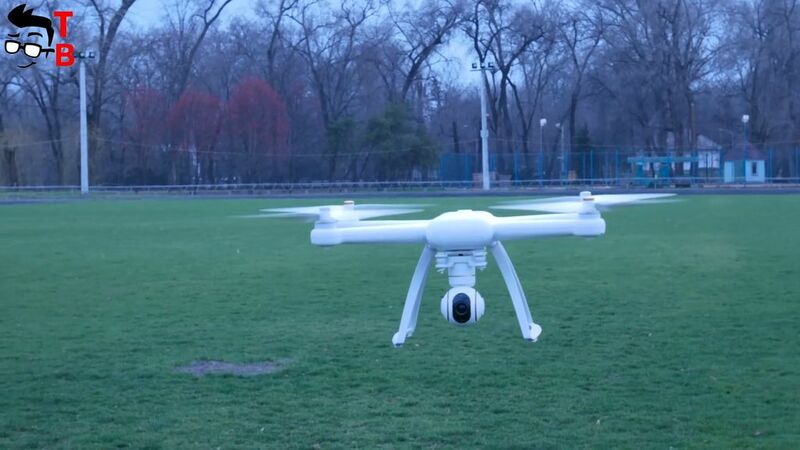 The maximum speed of the drone is 18 km per h. Of course, the device has various protections, for example, from low-level charge, loss of GPS signal, and other. As for the camera, it takes photos at a maximum resolution of 4000 by 3000 pixels. If we talk about video, then the maximum resolution is 3840 by 2160p at 30fps, 2560 by 1440p at 60fps, and Full HD at 100fps. More technical details you can find in description under the video. Let’s start the drone and see what it can do. 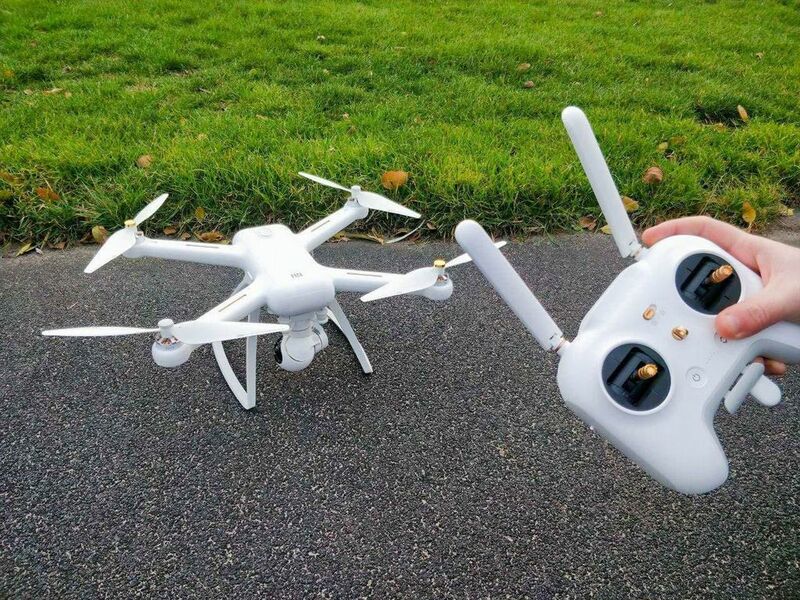 After you have inserted the battery, connected the gimbal camera and attached the propellers, you are ready to start the drone. First make one short, then one long press on the battery power button on the back of the drone. The device will make sounds and you will see the light from props. Now you need to turn on the transmitter. I will use USB dongle to connect the smartphone to the drone via Wi-Fi. Also you can connect it via USB cable. After that open Mi Drone application on your smartphone or tablet. Follow the instructions on the screen. You will be asked to choose the connection method (Wi-Fi or USB). When you first connect, you will see a tutorial video and tips. Done! If you did everything right, then you should see the image from the camera. On the screen you see a map with location of your drone. Also you can switch to FPV mode. On the main screen you can see such information as distance, GPS signal, and battery level. On the right side, you can start recording a video or take a picture. The settings menu offers options such as firmware upgrade, compass setup, beginner mode, Gimbal calibration and so on. 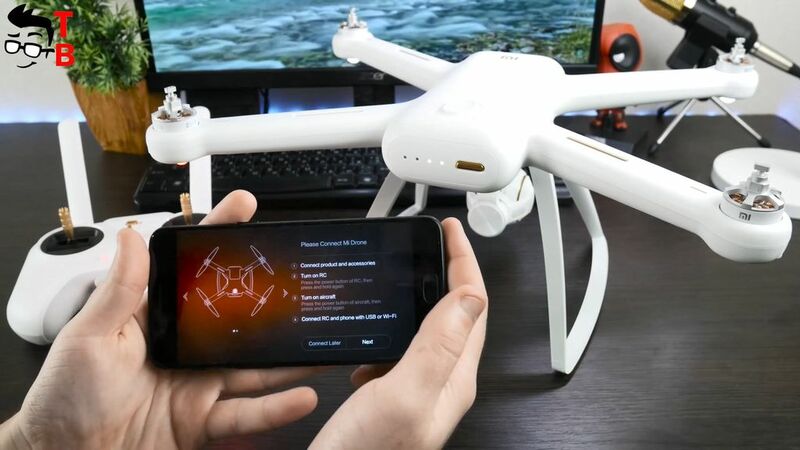 Also, the drone offers several interesting flight modes, for example, Orbit flight, Dronie Flight, Waypoint flight and Tap-fly flight. So let’s run the drone and see the video quality. 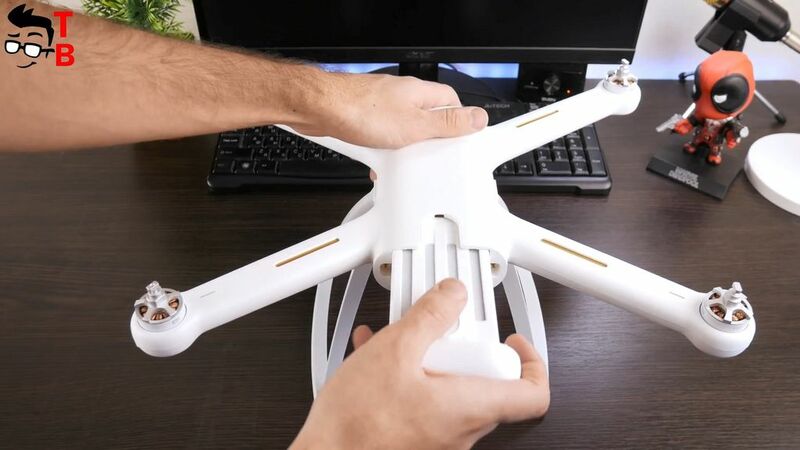 The drone is started by pressing two levers in the lower part towards each other. Hold on for about 3-5 seconds, and the propellers will start. The camera really records video in 4K resolution. The details is amazing, but the image is missing colors. It is not a big problem, you can add color rendition in any video editor. You should note that the sound is not recorded. If you don’t want recordings to stop randomly, you need microSD memory card class 10 with writing speed more than 20 mbits. I don’t notice any vibration in recordings. That’s very good. FPV range is amazing, and frame rate doesn’t drop below 15 fps. But I have some issue – FPV freezes from time to time. I don’t know what the problem is, but you need to go in map menu and return video mode to solve it. 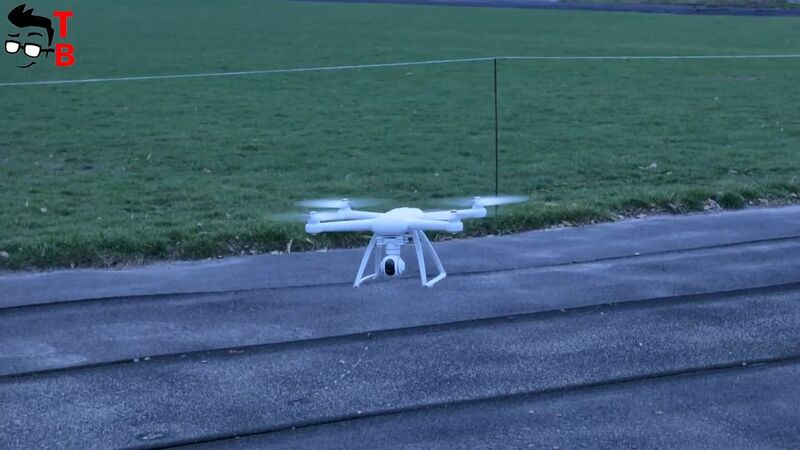 The drone really flies away for 2 kilometers, and even further. As for the battery life, my drone worked about 24 minutes. But you should know that I had cold weather. Also I want to note the excellent video quality at night. The details are amazing, and bright objects are not overexposed at all. In fact, I have not seen such a quality video on smartphones. Xiaomi Mi Drone 4K is impressive. In fact, this is my first drone, so maybe I did not tell everything about it. Nevertheless, I tried to say something that was really useful for me during the first launch. Xiaomi Mi Drone 4K has excellent build quality, good battery life, FPV mode and stable GPS signal. The application is quite simple, but there are some problems. For example, FPV freezes, and you need to go to the map menu and return to video recording, to see the image from the camera. In general, this is one of the best 4K drones by price quality ratio.